Adam Comrie vom EC-KAC wurde vom DOPS für einen Stockschlag für ein Spiel gesperrt. Adam Comrie (#44) of EC-KAC was involved in an incident deemed by the on-ice officials as Slashing (IIHF Rule 159) in the road-game in Vienna on Sunday, January, 20th 2019, time 26:33. 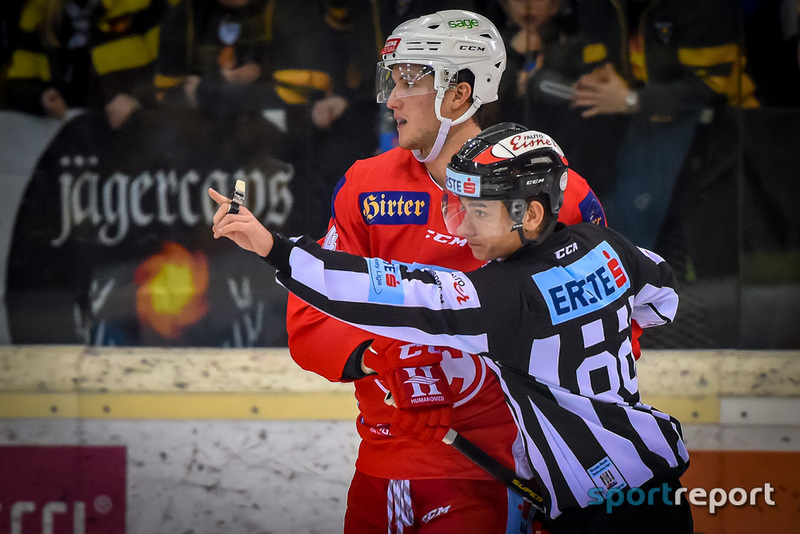 The video evidence was sent to the Erste Bank Eishockey Liga Player Safety Committee (PSC), which determined the incident to be worthy of supplementary discipline – Category 1 – ‘Careless’. According to the Arbitrator and having considered the video evidence and ruling of the Erste Bank Eishockey Liga PSC, player Adam Comrie (#44) of EC-KAC will receive supplementary discipline under rule 159 – Slashing. On January 20th, in Vienna, an incident involving (#44) Adam Comrie of EC-KAC occurred, which is deemed slashing. The slashing incidents were sent to the Erste Bank Eishockey Liga PSC, who determined supplementary discipline is required. With KAC on the penalty kill, an opposing player sets up in front of the KAC goalie. This is considered a normal game situation and nothing worthy of retribution or aggressive means by Adam Comrie. For no apparent reason, Adam Comrie makes a choice to use his stick in a recklessly endangering manner. As the video shows, Adam Comrie uses his stick in a targeted manner, directly at the top of the opposing players foot. With the play coming to a stop, due to a delayed slashing penalty, Adam Comrie looked at the referee, knew he was receiving a penalty, and then made a conscious choice to progress with another targeted and forceful slash to the top of the opposing players foot. As a reminder, hockey sticks are to be used for the purpose of playing the puck and legal defensive means. Hockey sticks are not to be used as a form of a weapon. There is no apparent reason and no possibility of the opposing player preparing for or protecting himself. Especially when the multiple slashes follow a pattern to an unprotected area of the opposing players body. Adam Comrie will receive supplementary discipline for a multitude of slashes, in the same form, directed at a non-protective area of the opposing players body. Effective immediately, Adam Comrie (#44) is suspended for 1 game and fined 250.00 Euros. From the perspective of DOPS and according to the Erste Bank Eishockey Liga Penalty Catalog Ref Nr. 125 – Slashing, Adam Comrie (#44) of EC-KAC is suspended for one games, effective immediately and fined 250.00 Euros.